Welcome to King of Swords! hank you for visiting King of Swords. As one of New Zealand's leading sword importers we have an open door to any sword in the world. 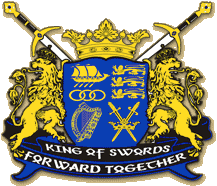 Also, if your club is linked to King of Swords you could ask for a 10% discount on request. If you would like to stay current with what's new in store, please subscribe to our RSS feed, as it's updated automatically when we add new items. Site is under construction. Still lots of products to add. If you can't find it on the site, contact us and we will get back to you ASAP.